There's a new addition to the list of the top 10 wind farms in the United States with the recent completion of the massive, three-phase 457.5 MW Panther Creek Wind Farm in West Texas. Tennessee Valley Infrastructure Group (TVIG) built phases one and two of the Panther Creek project (258 MW), while Blattner Energy was the balance of plant contractor for the 199.5 MW third phase. The list of the top 10 wind farms in the U.S. received a new addition recently, with the completion of E.ON Climate and Renewables' Panther Creek Wind Farm in Texas. The three-phase project, consisting of a total of 305 turbines, is capable of generating some 457.5 MW, easily moving the project into the Top 10. The massive project is in the big oil and natural gas country of West Texas. It's interesting to see clean energy, in the form of wind turbines, being generated smack in the middle of all the traditional energy infrastructure. This area, about 260 miles west of Dallas-Fort Worth, is not new to E.ON, however. Through Airtricity North America, which E.ON acquired in 2007, the company developed the 124 MW Forest Creek and 90 MW Sand Bluff wind projects in this area in 2006 and 2007. "We were already familiar with this area of West Texas," explains Bobby Blunt, vice-president of development for E.ON Climate and Renewables. "We know the wind resource in this area is very good." Panther Creek was originally planned as an offshoot of the Forest Creek and Sand Bluff wind farms-although it gained momentum and became a large stand-alone project, he says. "We felt it was a way to grow our wind power footprint in this region," says Blunt. The company had done initial meteorological mast profiling and started leasing additional land in Howard, Glasscock, and Sterling Counties through 2007 and 2008. By the time they wrapped up the leases, they had some 65,000 acres of contiguous ranch land, stretching about 25 miles, north to south. "It's a fairly spread out project," notes Blunt. The site area around the town of Big Spring shares a lot of geographical features with other wind-rich areas of West Texas. "What we liked is that there were outcroppings and some low hills and bluffs in the area-almost mesa-type features-that presented really well on the wind maps. And when we put our met towers up, they proved very strong locations for turbines." Not only was there good wind, there was also consistent wind. "We did not see a lot of peaks and valleys in the wind data," says Blunt. "It was very strong, right across the seasons." Taking on a wind project of this size poses logistical and construction challenges. Initially, however, Panther Creek was planned as a one-phase project. "At the beginning, the objective was to find a competitive windy spot where we could do a single phase of roughly 150 MW with a good amount of transmission capacity," says Blunt. "What happened from there is we continued to analyze the wind and transmission resources and moved farther south with our leasing efforts and wind measurements. The project grew from there." E.ON had established good business relationships with a number of area landowners with the Sand Bluff and Forest Creek wind projects. Many of these landowners showed interest in making more of their land available for additional wind projects. "We talked to them about leasing more land, and that land became phases two and three of Panther Creek," says Blunt. "We saw a great deal of support from the landowners and the community and were able to work closely with Oncor (the operator of the 345kV line) and the Electric Reliability Council of Texas (ERCOT), which manages the transmission grid for most of the state, to determine exactly how much capacity was available. That gave us the confidence to go into the additional phases." There is an interesting mix of land ownership in the region. Some landowners have a few hundred acres, and others have in excess of 10,000 acres. Having a track record of success with landowners-big and small-in the region, definitely helped the company, says Blunt. "I think the landowners got to know who E.ON was from the projects we had done before, and from our personnel," says Blunt. "And I think they liked that we were out there to consistently build relationships-not just build a project. That went a long way towards getting the land in place for Panther Creek." Although some landowners were familiar with E.ON, through the Forest Creek and Sand Bluff projects, some were not. "There was a group of landowners who were completely new to wind projects and our company," explains Blunt. "In that situation, it was a very traditional process, with a lot of kitchen table talks with landowners and family members, and doing what we could to show them we wanted to forge a long term relationship and take care of their property." They also emphasized that landowners could be involved with the turbine siting process. The Panther Creek site is mostly ranch land, with a few areas of limited farming activity. The project is on 65,000 acres of contiguous land, stretching about 25 miles, north to south. "One of the things that E.ON is particularly proud of is we will work with each landowner to understand their specific land uses and any preferences they have about their property. We do our best, within reason, to try to accommodate those land uses, so they have the highest and best use of their land, in co-existence with the wind farm." Building relationships was one thing, getting the actual leases was another. Blunt noted that the competition was heavy to build additional wind power in the area, with four other developers seeking to get approvals and contending for the same areas of land and positions on the transmission line. But E.ON won out. Tackling the construction of Panther Creek in phases-just due to its sheer size-made the project far more manageable. "At one point, we had to make a decision about the size of the first and second phases. We figured we had enough capacity on the transmission line that we could easily do 260 MW, and then we found we could go as high as 460 MW. "What we decided to do was essentially three phases in two-we had Panther Creek phases one and two, with 172 turbines, and Panther Creek phase three, with another 133 turbines." As a major wind power player, E.ON was familiar with the major brands of turbine equipment as a result of previous projects. Forest Creek used 54 Siemens 2.3 MW turbines and Sand Bluff has 45 Gamesa 2 MW turbines. "We were looking for a turbine that would serve the site best, achieve good results for the wind regime that was available, and was within our budget," says Blunt. "GE was a good choice for that. And we felt the 1.5 MW units would be strong performing turbines in this area." With that decision made, they moved into construction of Panther Creek. One of the key construction issues was that the area is heavy oil and natural gas production country. The Howard-Glasscock counties area is one of the most heavily developed energy fields in the entire state. "In some spots, it is nearly completely covered with pipelines, pump jacks, and rigs for oil and gas," says Blunt. One of the concerns was they did not want to interfere with any of the existing uses of the land, or possible future uses. That meant working with landowners and the oil and gas companies to determine what the near term and long term plans were for the land. "That resulted in very carefully laying out roads and underground collection lines, and micro-siting our turbines to make sure we were not interfering with any drilling activities or pipelines that were above or below ground or where there might be future drilling ." In advance of construction, E.ON carried out an environmental analysis of the area, looking at not only wildlife issues, but archeological issues as well. E.ON had two different balance of plant contractors for Panther Creek. Tennessee Valley Infrastructure Group (TVIG) handled phases one and two. "With the contiguous nature of the land through that part of the project, it made sense for TVIG to build phases one and two as though they were just one phase. Basically, they built the first two phases of the project in tandem." Phases one and two were built from north to south, and construction took about 10 months, from the first road being cut to the final turbine being commissioned. That might seem like a fast pace compared to other parts of the U.S. where developers might face adverse weather or land issues. But aside from the energy infrastructure that was in place, the land is mostly ranch land, with a few areas of limited farming activity. 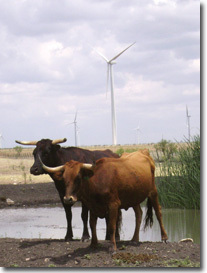 "Compared with some of our other sites, such as the Roscoe, Texas project, which is almost entirely a dryland crop area, and the Papalote Creek Wind project near Corpus Christi, which is heavily cultivated farm land, we didn't have as many of the nuances and specific land use type arrangements to accommodate farmers, who each have concerns about their particular piece of farm land. However, it was equally important that we addressed the ranching, pasture land, gates, fencing, and roadway concerns raised by the Panther Creek group of landowners." Blattner Energy was the balance of plant contractor for the 199.5 MW third phase. This area of West Texas does not see the extreme weather conditions that are present in other areas of the country. This allowed the contractors to work from February forward on each of the phases. "We were able to move quickly with the infrastructure, the roads, the underground work, and the micro-siting of the turbines," says Blunt. "When we got into the late spring and the summer, we were able to put turbines up at a pretty good clip." They still had windy days, though, when gusts made it impossible to deliver turbine components or mount blades and rotors. "It was a particularly windy spring and summer period-we had 62 "wind days" from April through August 2008, when we were building phases one and two." "We dealt with that a couple of ways," explained Blunt. "We had evening shifts where our crews worked late at night or early in the morning before the wind started howling." They employed portable lighting systems to carry out the night work. "We also had an aggressive concentrated effort during the July/August timeframe of 2008 to keep phases one and two on track. We brought in an additional crane and were putting up two or three turbines a day during that time. "We completed the erections of around 50 to 60 turbines in 30 days. It was amazing to see everyone work together efficiently to get the job done." Blunt emphasized that throughout all parts of the construction, E.ON maintained high levels of safety. Now that the project is completed, E.ON has gone from construction mode to Operations and Maintenance. The company's nearby Forest Creek and Sand Bluff use a shared maintenance facility, for E.ON's staff and Gamesa and Siemens staff. "That facility serves those projects really well," says Blunt. "We decided to do the same thing with Panther Creek, with phases one, two and three operating out of a new O and M building." The building also houses the computer systems for the wind farm, but Blunt notes they actually operate the wind farms from the E.ON office in Austin, about 200 miles southwest of the Panther Creek project. "We're able to control and monitor all of the wind farms from the fifth floor in our office in Austin, 24/7," explained Blunt. He said Panther Creek was both a challenging and interesting project to work on. Blunt himself brought a different skillset to the project, in that his background is in law, rather than construction or project development. He worked as an attorney with a law firm, handling electric and gas utility cases at the Public Utilities Commission of Texas and Railroad Commission of Texas, before joining up with E.ON. "The regulatory side and the law environment was great training for learning about the wind power industry and generation/transmission issues." Having said that, he's enjoying the project development work he's doing now. "I really like the pace of the renewable energy industry-there is a lot of action with a lot of things going on at once," he says. On top of that, sometimes it's just plain helpful having a lawyer at the table. "Having a law background helps with some of the more detailed permitting and legal items that come up on a day-to-day basis for developers," he says.